For parents conducting parent-teen driving lessons, there is a driving technique that can greatly help your teenage driver with their driving skills, and thus relieve you of parental anxiety. It is called “commentary driving” and is a huge benefit for teenage drivers having a hard time concentrating while driving or if their safe-driving skills need some serious work. 1) Provide lots of supervision. While driving schools in Parker, such as Western Slope Driving Institute, have expert driving instructors and customized training courses to help your teen drivers complete state-mandated traffic school training, parent participation in young drivers’ learning journey is vital to producing safe drivers. 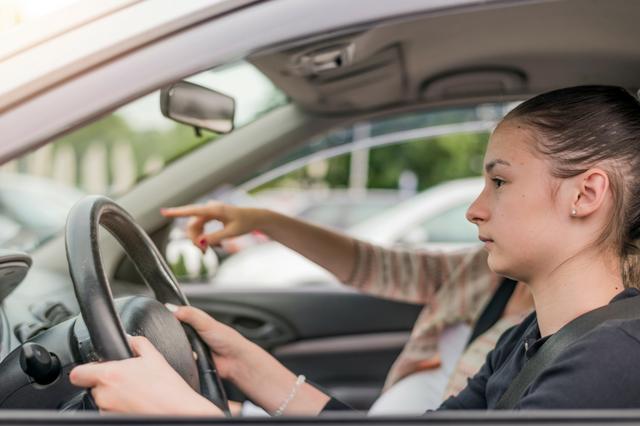 Sitting in the passenger seat with your teen when they’re learning to drive takes time, patience, and knowledge – and the only way to ensure they put into practice what they learn. Always keep their eyes on the road and their hands on the wheel. Never take their mind off of driving. Never call or text while driving. Limit passengers and night driving. Always remember that owning a driver’s license is both a privilege and a responsibility. 2) Start off with small trips. Practice driving with your teenager in various situations, including driving at night. But don’t take her to the freeway for her first driving practice. Instead of boosting your teenager’s confidence, the freeway experience might end up traumatizing them. Start small by letting them drive home from the grocery store, but don’t restrict your practice sessions to parking lots. 3) Help Your Teen Driver Practice. When getting your teenager a car to drive, keep safety, reliability, fuel economy, and price in mind. Overall, the car should possess a good safety rating, side-curtain airbags, and easy maneuverability. 4) Give gentle, constructive criticism. Teaching your teen how to drive is a long, grueling process and can become very exasperating for both parties. But no matter how frustrating the situation becomes, keep your temper under control. If you want your teenager to effectively absorb what you’re teaching, remember there’s a huge difference between criticism and constructive criticism. Criticizing constructively entails that you explain what your teen driver did wrong and then offer advice to help them improve. Remember, a berating tone won’t uplift your teen’s confidence. 5) Make sure your teen knows what to do in case of an accident. Nobody plans on being in an accident, but everyone needs to know what to do if they're in one. Every car should be equipped with an emergency kit. The kit should include a fire extinguisher, a first-aid kit, warning light or road flares, a flashlight, jumper cables, a whistle, as well as food, water, a blanket, and extra clothes and shoes. You never know when your teen might need any of these, so best to have them ready at all times. If someone’s injured, call for medical help. Obtain the contact information of the people involved, also those of eyewitnesses. Telling your teen what and what not to do while driving is useless if you don’t walk the talk. New teen drivers learn mostly by watching how adults behave behind the wheel, so practice what you preach. Commentary driving is when a student driver says aloud her observations of the traffic situation, what she is thinking, and the driving techniques she plans to employ, as called for by the circumstances that have evolved and are still evolving. Commentary driving is encouraged to inculcate in your teenage driver a sense of foresight by being observant and keenly aware of her surroundings, hence the ability to react fast and accordingly. Commentary driving works for any situation, such as when stopping, at junctions or roundabouts, when with cyclists, at pedestrian crossings, or when passing parked cars. Teenage drivers should also verbally acknowledge the road signs and markings they see, other drivers following too closely or changing lanes illegally, the traffic lights ahead, and even their current speed, including when they plan to ease off the gas or accelerate. Commentary driving is best suited for students who have already mastered the basic driving skills and maneuvers. It can, however, also be incorporated for a limited time during the earlier lessons to sharpen student observers’ visual skills and strengthen their safe driving habits. Because teens learn better through demonstrations, as parent-coach, make sure to model the technique well before asking your teenager to have a go at it. Practice commentary driving in relatively simple situations before advancing to more complex environments. Vague language such as “checking ahead” does not help with your child’s awareness level. The commentary should be specific to the situation your teenager is in. "Checking mirrors, left mirror, cyclist too close by, let them pass, ease off gas"
"Intersection ahead, green light, checking mirrors, no cars behind, approaching intersection, light still green, checking intersection left and right, all clear, crossing intersection"
Unless it is absolutely necessary, resist the urge to verbalize your own observations or ask questions. Doing so distracts your teenage driver from focusing on the situation in front of them. Worse, it may discourage them from voicing their own thoughts and rely on other people’s observations. Instead, log all your comments in a notebook and discuss them with your child after the practice session, when the car is safely parked. Especially in the beginning, your teenage driver may find it extremely difficult to talk while driving. Don’t get mad or lose your patience whenever they stop commenting. Instead, encourage them to keep going by asking them to tell you what they see and what they plan to do. When your student driver starts showing signs of fatigue or stops commenting despite your numerous prodding, it may be time to end the lesson. Emphasize that when a driver stops commenting, their hazard-spotting abilities and alertness levels go down significantly. Commentary driving, when properly implemented, helps your teenage driver become a safer driver. Remember though that it takes time and requires a good dose of patience before they can fully master the technique. For questions regarding commentary driving, the courses we offer, schedules and pricing, give us a call or visit any Western Slope Driving Institute location. We would be very happy to help.